Sometimes a Blog can really draw me in. Before I know it, I have spent an hour perusing other peoples lives. But that doesn't happen often...Having left NYC for salty air, I find myself enjoying other peoples accounts of the parties I used to go to, and the people I used to see. Melissa Morris is a great customer of CK Bradley, looks great in almost anything she wears...and has an adorable dog, Monty. 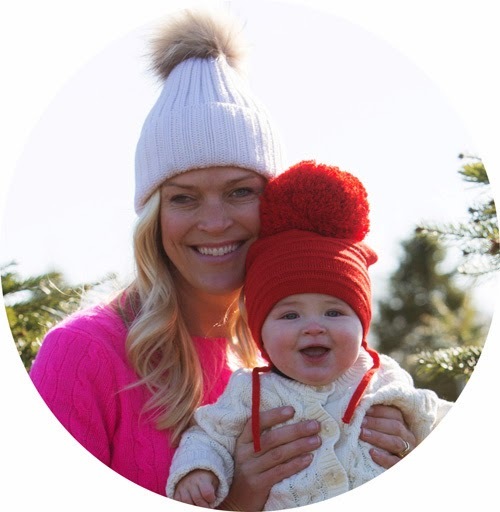 Her Blog has accounts of nearly everything from eating to travel to..a day in the life of Melissa. Scrolling away, I came upon Melissa wearing CK Bradley with Tory Burch. Love it. You look fabulous Melissa! It made me do a little thinking about Tory Burch. CK Bradley had been around for a year or two when Tory decided to start her business. Tory hired my first employee, Meg Doepke to be her right hand woman. Meg was great at CK Bradley back in the day, and Tory was SMART to hire her. 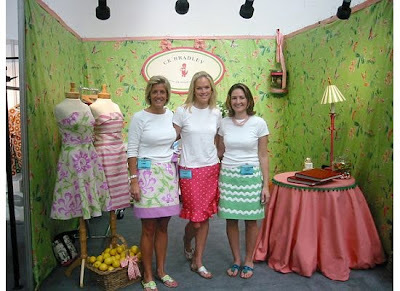 Meg actually still works for Tory today, and I run into her outside of the daunting orange walls they put up around the Tory Burch booth at the Coterie every year. The Coterie, for those of you who don't know, is THE show where boutiques and larger department stores come to buy lines for the following season. This was CK Bradley's FIRST Coterie Booth in 2004. Tigger is in his kelly green cage in the right hand corner! All of our samples were in white fabric, and we had drawn the print on laminated paper for stores to pick and choose what color ways they would like. This will require another blog, since I am getting OFF topic reference Tory Burch. So back to Tory. Who is the Tory customer? I don't own anything she makes, but that's not to say I don't like her taste, I do. So why don't I buy her stuff? Something to ponder. And it's NOT because I get to design my own clothes...my closet is full of Marc Jacobs, DVF and old Tocca. 2. Tory is smoking HOT! hand raised! I'm a huge fan of Tory's Reva flat. I'm actually sporting my black patent pair today. I am a loyal wearer of the TB "reva", but only because I can't wear flip-flops in my office. I find a lot of the colors and patterns she uses are VERY similar to CKB designs. I choose CKB dresses and tunics over TB because I prefer the fabrics and the fit.